What can Graston Soft Tissue Therapy do for me as a patient? The stainless steel instruments are applied to the skin overlying muscle, tendons, and ligaments, and acts as a scar tissue stethoscope. When knots or bands or scar tissue is encountered, both the Doctor and the patient sense a restriction or granular feeling. The instrument can then be used to “break up” this restriction or adhesion. Stretching exercises are then used to promote realignment of the fibers so that they behave more like normal, healthy tissue. The instruments effectively break down collagen cross-links (scar tissue), and stretches connective tissue (adhesions) and muscle fibers. This technique will also increase skin temperature and allow for increase blood flow to the treated area for accelerated healing. 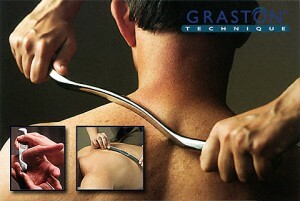 Graston Technique is most effective when coupled with the necessary strengthening and stretching exercises, and chiropractic adjustment. As the body heals from injury, it will deposit layers of scar tissue. The scar tissue limits range of motion, causes congestion and can block your circulatory system leading to pain, swelling, and loss of proper joint and muscle function. Thus, when someone feels tight and movement is painful, they are feeling the binding effects of scar tissue. "Graston Technique® was used to relieve and eliminate plantar fasciitis, soleus and gastrocnemius caused by excessive back pedaling, planting and sprinting forward while officiating NFL games. When my symptoms returned after normal therapy, my physical therapist and athletic trainer suggested GT. Without a doubt, the recovery accelerated, the pain diminished within days, and the tendons and muscles were allowed to be stretched and strengthened to eliminate recurrences." "After trying the Graston Technique® for the first time, I not only achieved instant results which showed in my flexibility and in my training, I am able to take my athletic career to the highest level competing with the best in the world. I am able to train more in depth at a higher intensity .... producing better and faster times in the athletic world. "With the World Championship this year and the Olympics right around the corner, I cannot afford to settle for mediocrity and with this technique I know that I can, and will, be a force to reckon with.